Marseille is a city in the south of France, nestled between Montpellier and Nice. It's a five-hour drive from Barcelona in Spain, making it an easy weekend getaway. The bustling port town is the second biggest city in France, behind Paris, and is also the oldest city in the country, dating back 2,600 years ago. Because of its long past, there are many historic sites to see, from Roman ruins and medieval churches to opulent palaces. The city is famously known as the place where bouillabaisse—French seafood stew—originated. You can't visit without trying this fresh fish dish for yourself. The AVE train from Barcelona to Marseille takes about four-and-a-half hours total. Barcelona has some of the best railroads in the country, making trains a better (and faster) option over buses or cars. The high-speed AVE train—operated by RENFE—is also affordable and extremely easy to navigate for foreigners. There are three buses a day from Barcelona to Marseille. The journey lasts roughly seven hours with the many stops that the bus takes along the way. Buses from Barcelona to Marseille depart from both Sants and Nord bus stations. ALSA is the most popular bus company in Spain, however, Movelia and Avanza are reliable options as well, if you choose to go that route. The 500-kilometer (or 310-mile) drive from Barcelona to Marseille takes about five hours, traveling mainly on the AP-7 and A9 roads along the south of Spain and crossing the border into France. Keep in mind that AP roads have tolls, so it's best to bring some euros in cash and coins to pay during your road trip. If you're not from Spain, don't worry, it's still very easy to ​rent a car for the drive. Plus, main rental car companies like Hertz, Budget, National, and Alamo, are almost always available, especially if you pick it the car up at the airport. Although there are many gorgeous seaside towns along this route, consider spending some time in Figueres. Just an 90 minutes outside Barcelona (near the border of Spain and France), Figueres is a picture-perfect hamlet known for its Salvador Dali Museum. 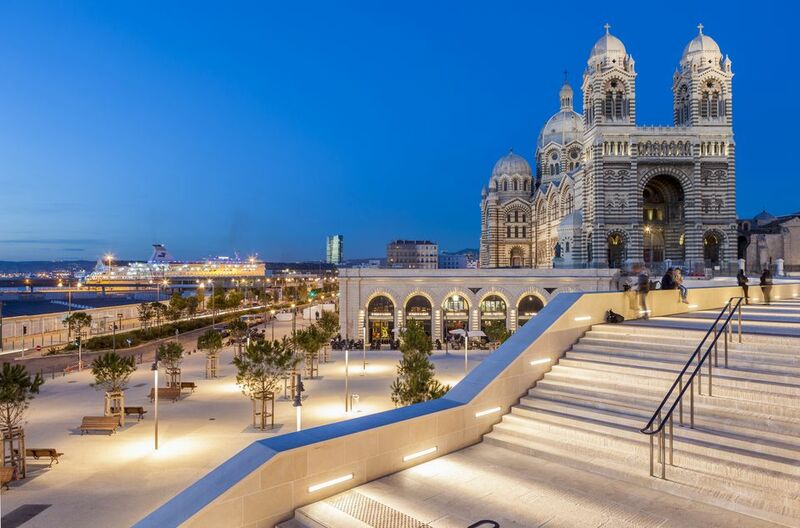 Once you get to Marseille, the public transportation within the city is easy to manage for those who want to take the bus or train. There are many bus routes as well as two metro lines and two trams run by RTM—all of which are cheap and simple to figure out (even if you don't speak French). You can buy a public transit pass at any metro or bus station in Marseille, and that ticket works for the bus, metro, and tram. If you opt to buy a single ticket, remember it can only be used for one hour before it expires. For those staying in Marseille longer, it would be wise to purchase a week-long pass that is valid for seven days and only costs about $15.